Eesti Pank gave out prizes on Saturday to the eight children who had reached the final of the drawing competition to find a design for the two-euro coin dedicated to the 150th anniversary of the Song Celebration. The public vote was held over three weeks and was won by 15-year-old Grete-Lisette Gulbis from Tõrva in south Estonia. 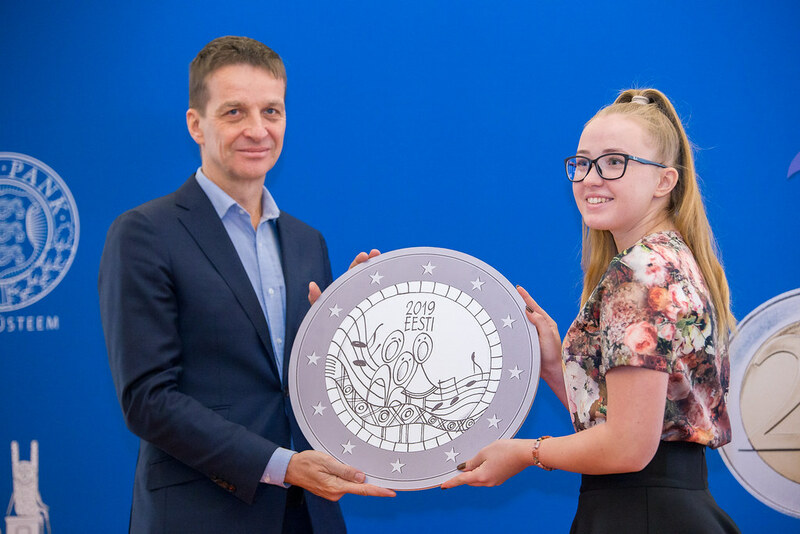 The design for the two-euro coin by Grete-Lisette Gulbis, a student at Tõrva Gümnaasium in the south of Estonia, received 2887 votes, representing 35% of the total of 8322. “At first I didn’t want to submit my design to the competition as I wasn’t entirely happy with it, but my parents encouraged me and so finally I sent it in”, she said. Grete-Lisette was inspired for her design by the Song Celebration procession, where she had seen the cheers of joy and pride, the multitude of national costumes and the rows of singers flowing like waves on the sea. “It is really fantastic that so many children took part in the drawing competition. I want to thank all the teachers and parents for their help and for the encouragement they gave the children. This is a very valuable gift to have given Estonia in this centenary year”, said Ardo Hansson, Governor of Eesti Pank. He said that only one drawing could be fitted onto the coin for the Song Celebration, but that all the eight children who had got through to the final were winners, as only one design in a thousand had got that far. The prize of an iPad with drawing stylus went to Victoria Irval (pre-school to 3rd year), Marit Peedumäe (4th-6th year), Grete-Lisette Gulbis (7th-9th year) and Miia Laur (10th year and above). Portable speakers were awarded to Lennart Teinbas (pre-school to 3rd year), Kaarel Lusti (4th-6th year), Elizaneth Saks (7th-9th year) and Birgit Raidna (10th year and above). Art teacher Mari-Liis Männik from Koeru Gümnaasium, whose children submitted the most drawings, received a 1000-euro voucher from Eesti Pank to buy art materials with. Eesti Pank will now work with the mint that will create the coin to convert the winning design by Grete-Lisette Gulbis into a form that meets the technical requirements for minting. After that the coin design will be formally approved by the Supervisory Board of Eesti Pank and will go for approval at the national and European Union levels. The two-euro coin with the special design dedicated to the Song Celebration will enter into circulation in the first half of 2019. There will be a draw from among the voters who gave their email address for 25 coin cards for the coin dedicated to the 150th anniversary of the Song Celebration. Winners will be contacted by Eesti Pank by email in March and will receive their prize within two months of the coin being issued in 2019. Eesti Pank, children’s television programme Lastejaam, and the Estonian Song and Dance Celebration Foundation last year invited children and young people aged under 19 to send drawings to the central bank from which one would be chosen to create a two-euro coin dedicated to the 150th anniversary of the Song Celebration. The drawings were submitted in four age groups: pre-school to 3rd year; 4th-6th year; 7th-9th year; and 10th year and above up to age 19. The drawing competition last autumn proved exceptionally popular with more than 8000 children submitting designs for it. See the infographic  to find out where in Estonia the drawings came from. A 12-member jury convened by the bank last December chose 96 of the drawings to be sent on to the final deciding jury. The first round jury was composed of central bank staff, and each picture was looked at by at least three people. The final jury convened at the end of January then chose eight designs, two from each age group, to go into the three-week public vote. The members of the final jury were Liina Tõnisson of the Eesti Pank Supervisory Board, artists Maria Valdma, Mall Nukke and Vano Allsalu, chief conductor of the 2019 Song Celebration Peeter Perens, Song Celebration conductor Maret Alango, composer Pärt Uusberg, and senior editor of children’s programming at the Estonian national broadcaster Margus Saar. Central bank staff on the jury were deputy governor of the bank Madis Müller, head of the cash and infrastructure department Rait Roosve, and designer Triinu Talve. A total of 8322 people voted for their favourite among the eight designs in the three weeks of the online vote. Each voter could only vote for one of the designs. Two designs from each of four age-groups were entered in the vote. The designer in each age-group that got the most votes won an iPad Pro with drawing stylus, and the second-placed design won a portable speaker. Eesti Pank may alter the design slightly together with the author before the coin is minted. Before the coin is finally minted the design will be approved at the national and European Union levels.